This is the perfect salad to brighten up a dreary winter day. I was craving something fresh and bright yesterday and this fit the bill perfectly. Something about being at birthday parties surrounded by coughing children leaves me with an urgent need to consume citrus. Plus the plumello, kind of a less bitter or sweeter grapefruit, is my new favorite thing for looks and taste! *Also, to make this Whole30 compliant, just leave out the honey in the dressing. It still tastes great. Wash and dry the lettuce and all other fruits. Cut the head of green lettuce in bite sized pieces and place in a large salad bowl. Make 3-4 slices of the plumello and cut them in half to use as garnish around the bowl - so pretty with the lime green and hot pink! Cut one orange and the lime in half and juice half of each, Reserve juice in a small jar for the dressing. Next, segment the remainder of the citrus fruit - I use this method. Add the fruit to the bowl. Dice the avocado and add to the bowl along with the almonds. The last step is for the pomegranate arils. You can buy these from the Pom brand or at Trader Joe's already removed from the fruit and ready to go, but it is quite easy (and cheaper) to do it yourself. First, select a fruit that feels very heavy for its size. Slice it in half and submerge in a bowl of water as your are releasing the arils from the membrane - this helps to avoid the red splatters on you and the kitchen and the bits of white membrane will float, making it easier to separate it from the arils. Top your salad with these beautiful jewels of the food world! Now for the dressing. Add the white balsamic, honey and garlic to your jar of orange and lime juice. Put the lid on and shake vigorously until homogeneous. Add the oil, slowly, while swirling the jar around to help it emulsify. Put the lid back on and give it a good shake. I like to dress the salad with barely half of the jar immediately before eating and allow guests to add more to their liking. There's nothing worse than an overdressed salad, in my opinion! I hope you enjoy this recipe! It certainly is a pretty dish to take to a holiday party. This sounds really good. 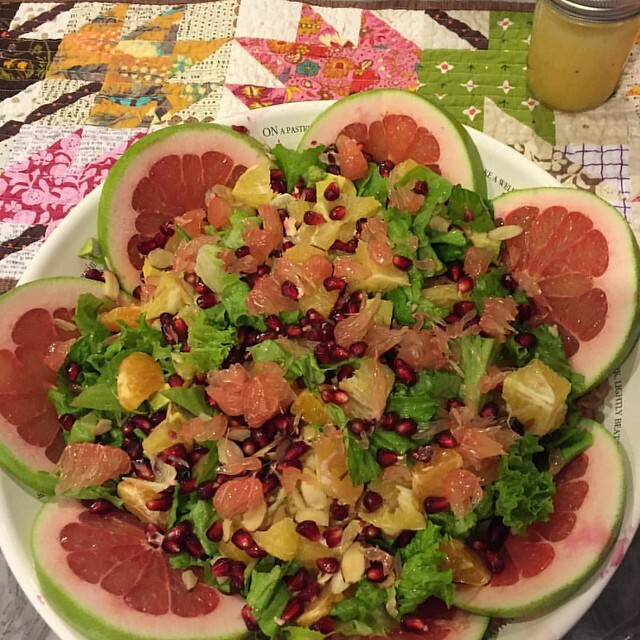 I like adding citrus to salad greens.